When the temperature starts to climb, I start seeking shade. Not that I’m wimp or anything, but being outside is fun–just not with a sunburn or being a sweaty mess. 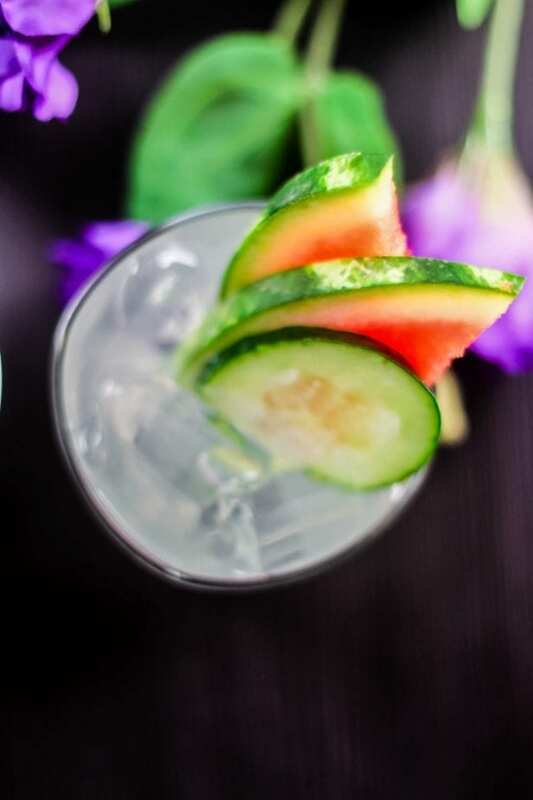 So, the pool, a Watermelon Cucumber Tonic and shade, that’s the summer-life for me! 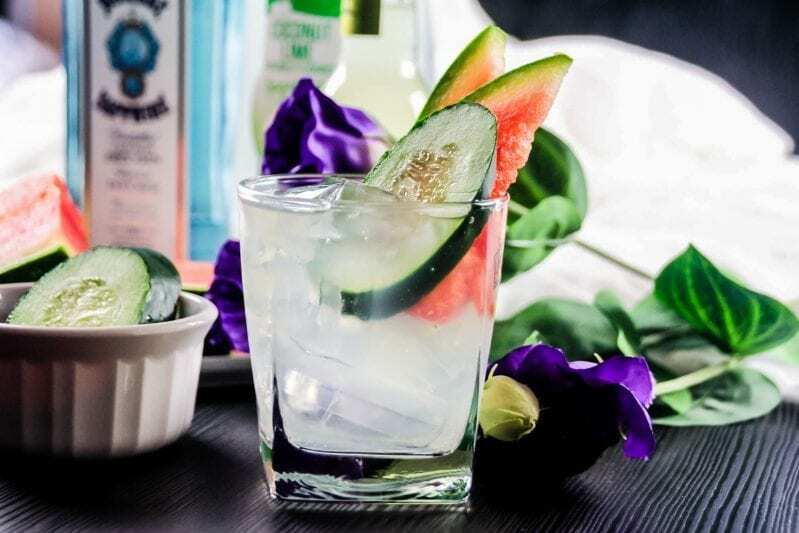 One of the things I love best about this Watermelon Cucumber Tonic is, well, the watermelon. 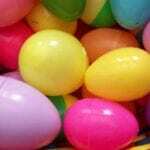 I can’t get enough of it during the summer, but I also always end-up throwing some out, which makes me sad. 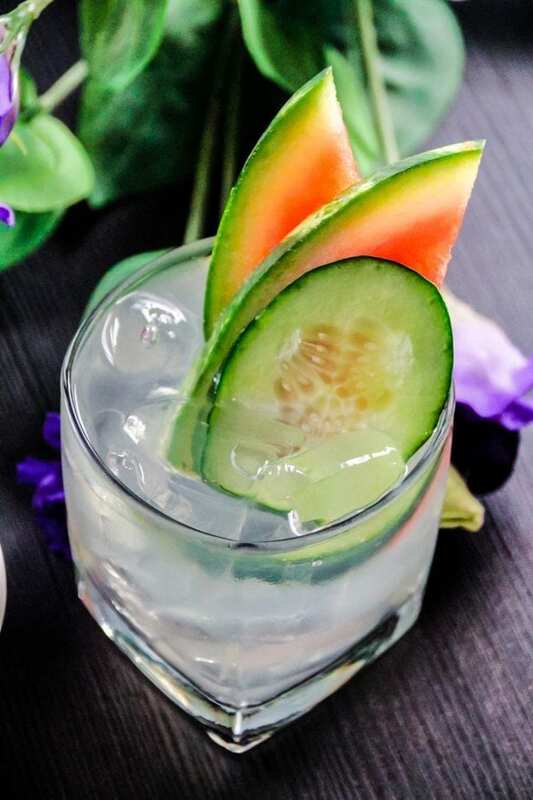 So, as the summer wears on, I am SUPER excited to already have this Watermelon Cucumber Tonic in mind for making–that way I can use all of my watermelon every time. 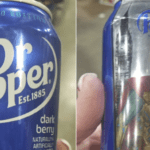 Plus, I get a tasty adult beverage, which I pretty much never am NOT excited about. 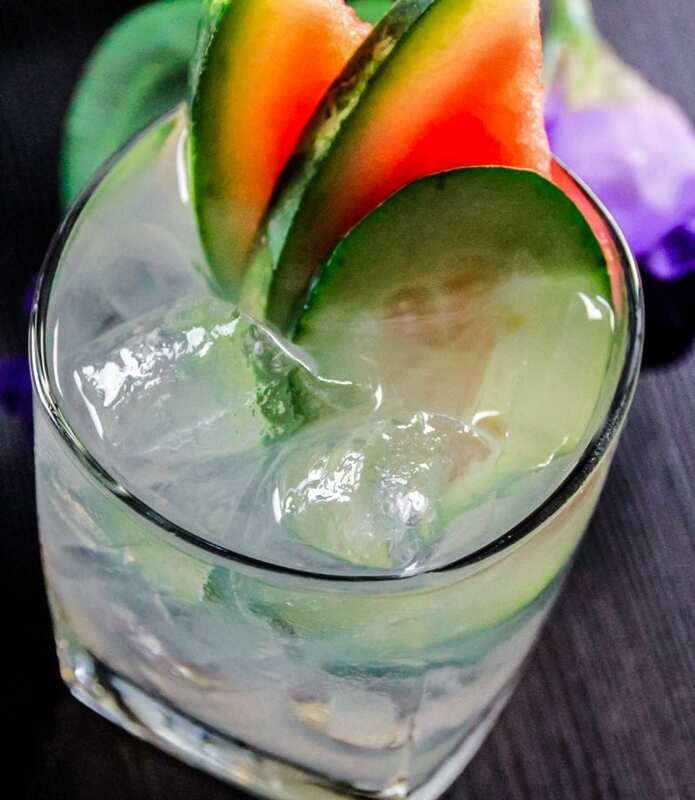 It’s a simple cocktail to make, too. Five ingredients, about 3 minutes, and you’re in cool-breeze-in-my-mouth heaven. Don’t skimp on the Bitter Lemon Tonic, either. 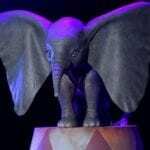 It sounds terrible–and by itself, it’s pretty, well, bitter, if you know what I mean. Add some ice, and that Bitter Lemon Tonic is starting to taste pretty darn good, quite frankly. 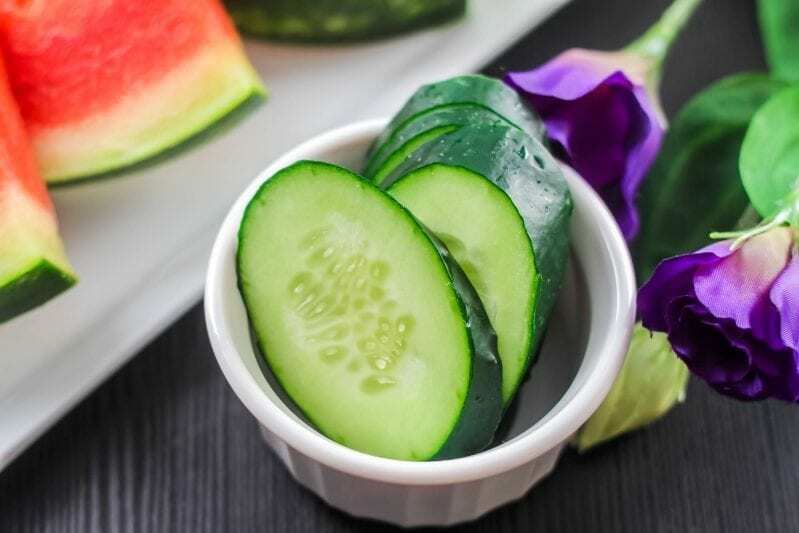 And, if you were a cucumber type of lady, like myself, you just go ahead and load-up a couple of slices of cucumber–and a little side bowl for dipping and snacking. Because cucumbers are a pretty delicious treat. Not to be at ALL overshadowed by the watermelon. 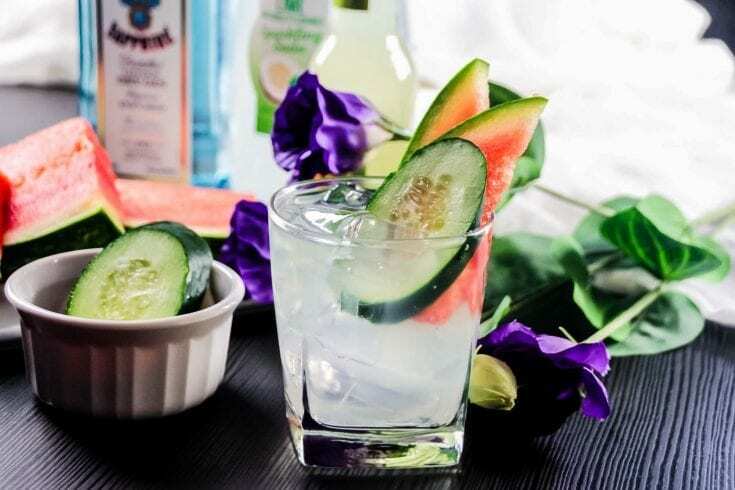 Although the watermelon slices are my very favorite part of this whole Watermelon Cucumber Tonic, for real. I’m not actually certain I wouldn’t just drink this and eat a whole watermelon, on fine, hot afternoon. Because I think I would. As a matter of fact, it sounds like a great plan for this weekend. 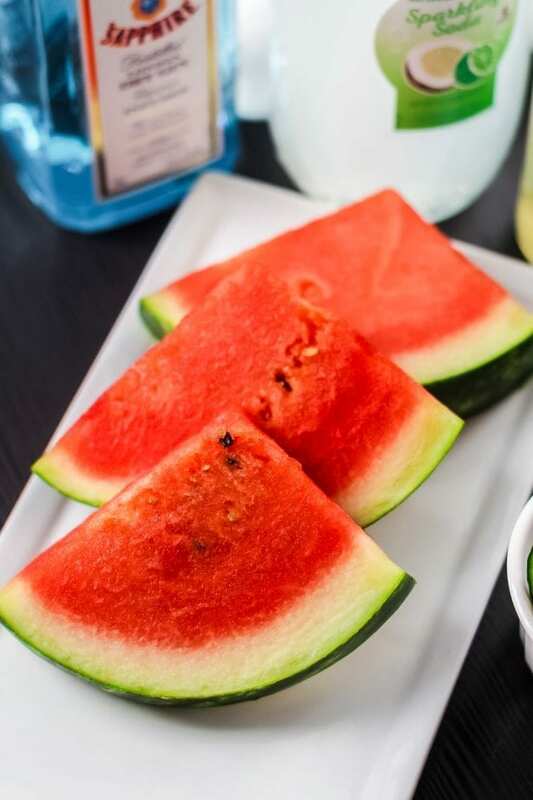 I’ll just head out to the pool with a sweet drink in hand and a watermelon under on arm and dig-in right on the picnic table, with a spoon and some salt. I’ll bring little ice bucket and the cutting board for more cucumber. It’ll be my own little party while I watch the kids run around in the yard. Dude, I can already see it. The plan is in place. It’s up to you to plan your own little mini-party for one (with a watermelon). 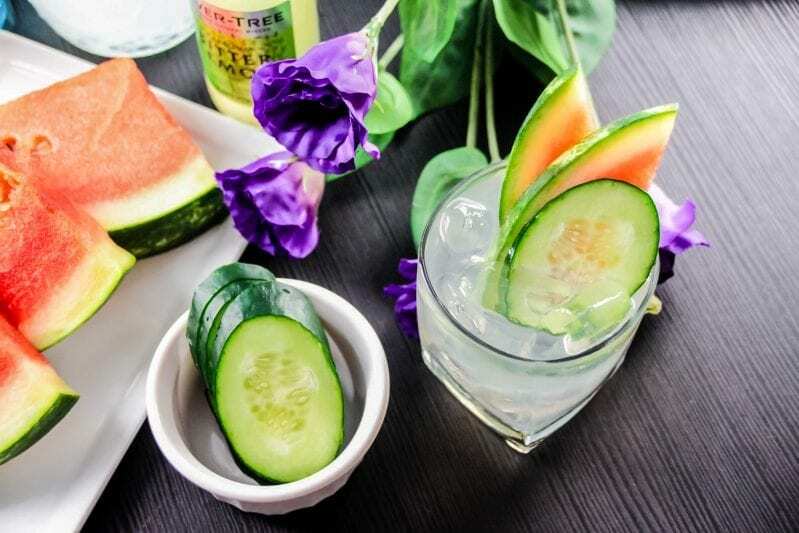 If you’re ready to dive-in and make this Watermelon Cucumber Tonic for yourself, but you’re out of watermelon, don’t give up yet! 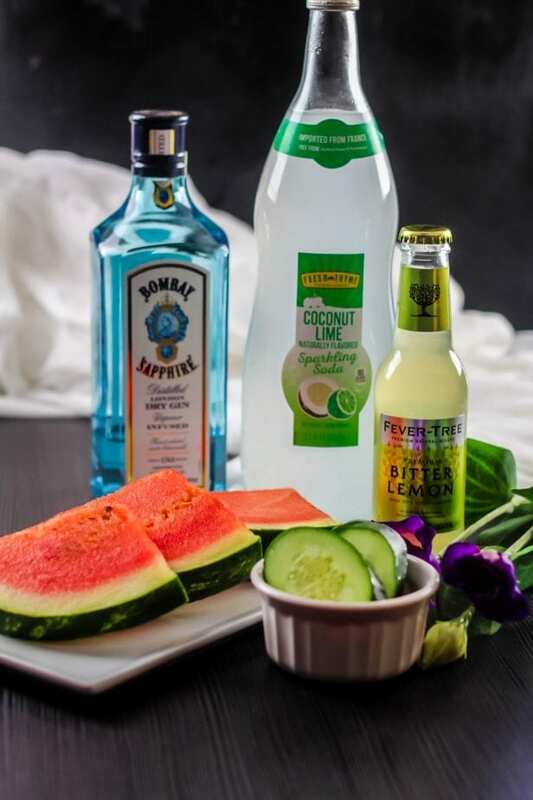 Just pin this recipe to your favorite cocktail ideas board on Pinterest, that way you can find it when the watermelon fairy brings you a big ripe one. 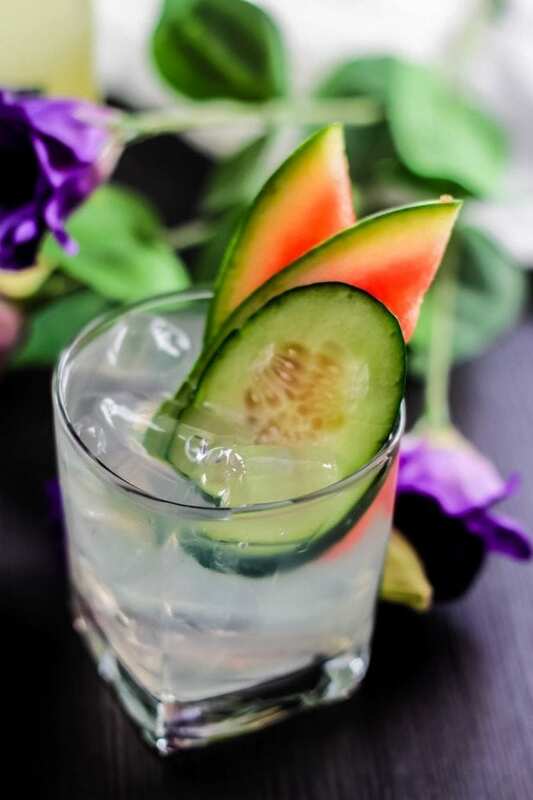 Oh, and if you make this Watermelon Cucumber Tonic and you love it, be sure to drop us a 5-star rating on the recipe. That’ll let us know you want more yummy recipes like this one from us! 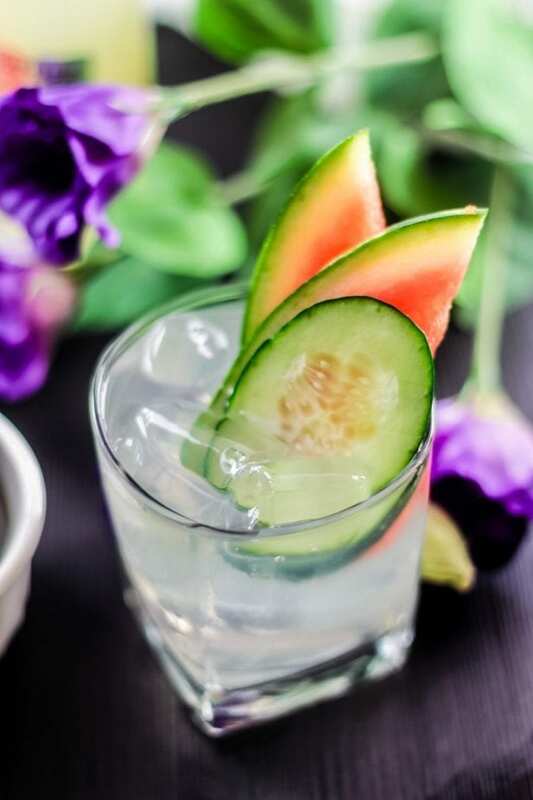 Summer is creeping up on us and I am chilling this spring with this amazingly refreshing Watermelon Cucumber Tonic. 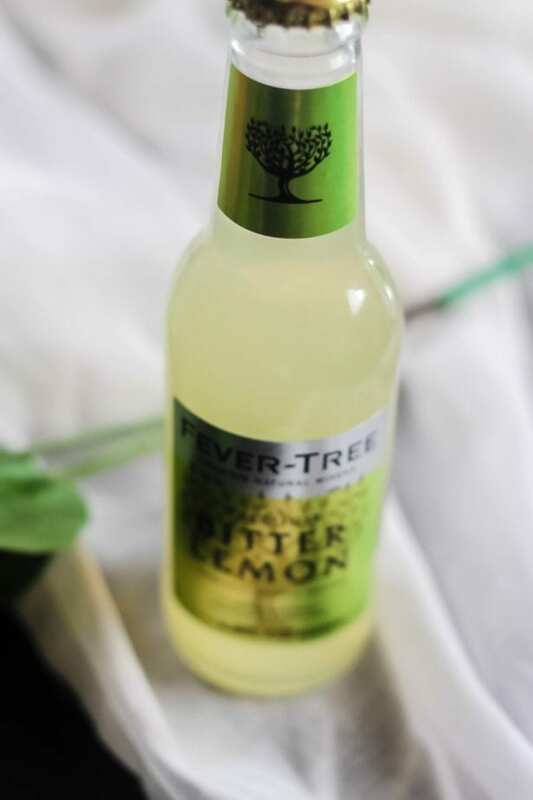 In a cocktail shaker add bitter lemon tonic, gin, coconut lime sparkling soda, and top with crushed ice. 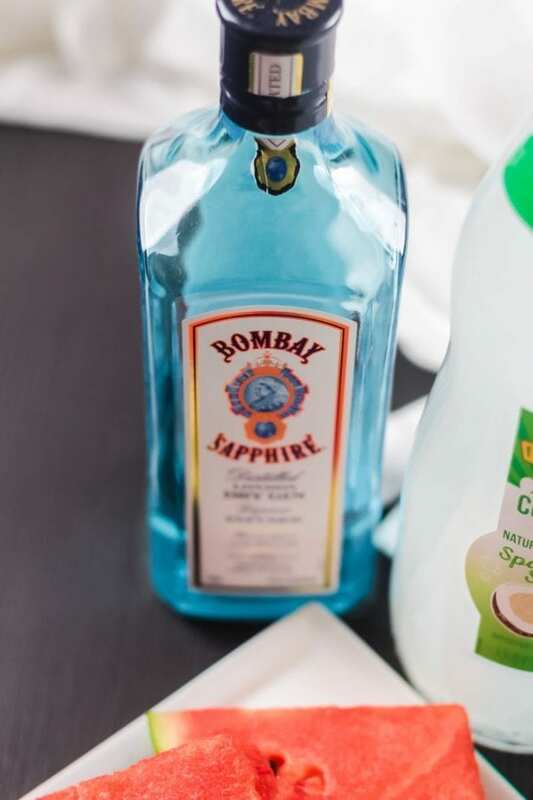 Combine the ingredients by mixing them together using a cocktail stirrer. Do not shake this cocktail in a cocktail shaker. Strain mixture into a standard rocks glass filled with ice. 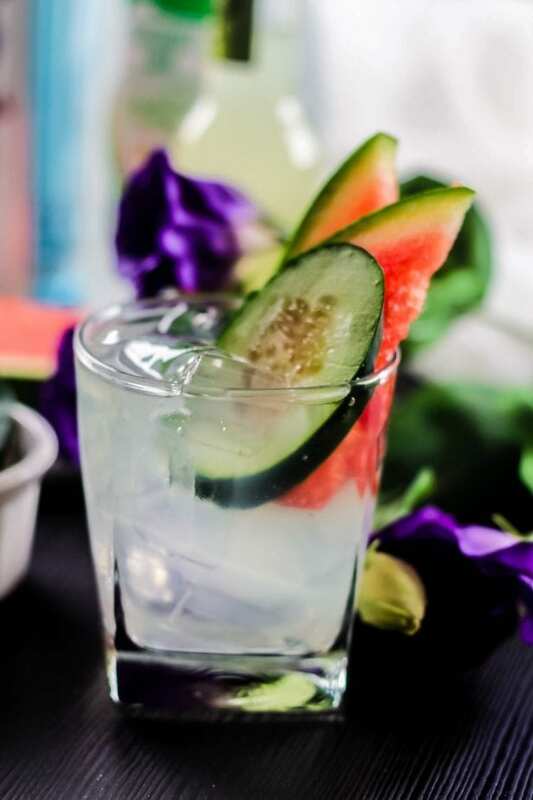 Garnish with two wedges of watermelon and a round of cucumber.